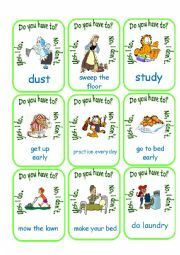 Worksheet for introducing the use of should or shouldn´t. Read the sentences and fill in the blank. 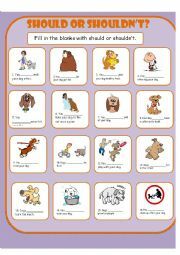 This worksheet has a pet care theme. 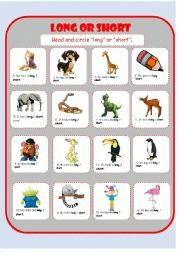 Worksheet for introducing the adjectives long or short. Circle the correct option. 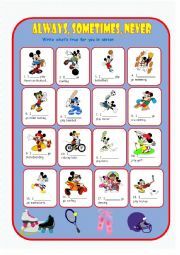 Mickey Mouse themed exercise for practing Always Sometimes Never. Read the sentence and fill in the blank. 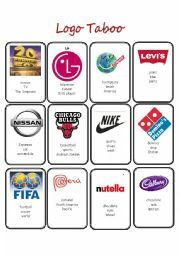 This is a taboo game for learning about famous advertising logos. Student has to describe the logo without using any of the words on the car and the others have to guess the logo. 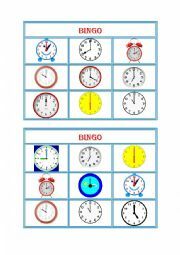 This is a bingo game for learning the hour ("O´ clock" only!). Includes 12 playing cards. 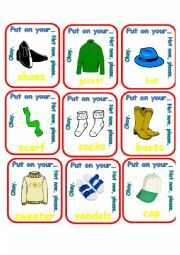 This is a go fish game for practicing the modal "have to" along with household chores vocabulary. Complete set with instructions. Activity Card for talking about hobbies. Includes a short vocabulary exercise with key. 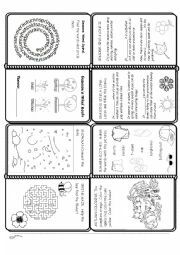 This mini book has activities for each season plus a song activity from Peter Weatherall´s "Seasons Song" https://www.youtube.com/watch?v=FmImAhAMjEY.